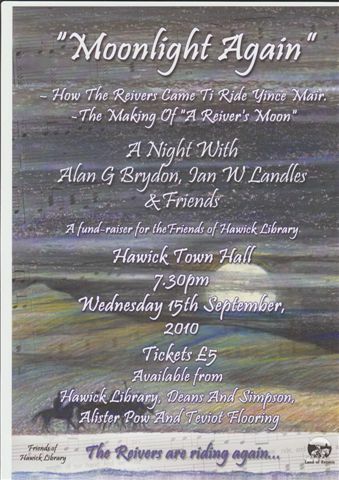 For those of us who are lucky enough to have the names of the Border reiving families in our ancestry, an evening in Hawick Town Hall, 44 High Street, Hawick, TD9 9EF at 7.30 pm on Wednesday, 15th September 2010, will provide an insight into life in the Borders and the Debateable Lands and this time. The title means How the Reivers Came To Ride Once More. This is the first talk on the Society's syllabus of talks held in 2010/2011, and will be held at Foulden Village Hall, Foulden, Berwickshire, TD15 1UH, Scotland on Sunday, 26 September 2010. When the Foulden Mordington and Lamberton Community Council were granted Arms by Scotland's Lord Lyon, three of the quarters contained armorial bearings representing those families with the most ancient connexions with those parishes: Ramsay, Lauder, and Renton, and who had the longest periods of unbroken tenure. Gregory will look at this history as well as touching upon other longstanding families such as the Arnot, Wilkie, and Jeffrey families. Doors open at 2pm. Talk starts at 2.30pm. We warmly invite you to attend the talk whether you are a member or not. There is no admission charge. We'll have a range of family history publications available to buy. Light refreshments available after the talk. If you have a problem with your family history, please discuss it (no charge) with one of our volunteers. Nothing to do with family history, except that one reader now living abroad said that she missed the events in the Borders. I had intended to go and watch the competitions at the Melrose Pipe Band Championships, however, I got sidetracked by the research I'm doing for the forthcoming Melrose Poor Law Records publication and the talk on Melrose Poor Relief 1871 - 1890, that I'm giving at our forthcoming Family and Local History Fair and Conference. If you're interested in Melrose in the late 19th century, or in poor law, do please book a seat. So, in the end I got to Melrose in time to see the bands parade through the streets; along the High Street from Gibson Park (where the event was held), along Buccleuch Street, up Abbey Street, into Market Square, and down the High Street. It's my impression that there were far fewer bands than last year, obviously the recession's biting hard, so let's hope there will be more bands next year. Here are a few videos I took. I was fascinated by the BBC programme episode shown last night (Friday evening) of Who Do You Think You Are with Rupert Penry-Jones, the actor. It was interesting to see the part played by a medical unit in a World War II battle, and I hadn't appreciated either the size of Monte Cassino or the height at which it lies. Rupert's ancestor, William Thorne and his men, clearly saved many lives through their actions in the battle of Monte Cassino – what heroes ! More fascinating was the story that one of his ancestors was Indian. Rupert followed the trail from his' great great grandfather, Theophilus Thorne, his marriage to Sarah Todd in 1885; Sarah's birth record; Thomas and Louisa Todd's marriage in South India in 1866; Louisa's father, Thomas Johnstone, whose name is on the Quarterly Alphabetical Nominal Rolls of the whole of the Europeans of the 1st Madras Fusiliers in 1857 - he left England in 1842. The 1st Madras Fusiliers was an East India Company regiment that ruled British colonial India until 1857. Thomas' regiment was stationed in Allahabad during the Indian Mutiny/War of Independence in 1857. The researcher has discovered letters he wrote to his wife, Louisa - amazing that they survived and could be found. Louisa was born on 25th Feb 1832, maiden name Smith. Rupert searches on Family Search and finds two entries, follows the first one, (http://www.familysearch.org/eng/default.asp) discovers that her mother, Susanna, was described as an Indo-Briton, born in 1817 in Nagpore; and then visits All Saints Church in Nagpore and finds a birth record relating to Susanna's mother, Elizabeth, who was fully Indian. However, I wonder whether the researcher's looked at the second entry on the Family Search results which shows the mother as Susanna Callum, however it also shows Louisa's death in 1836. Clearly, if Louisa died at the age of 4, she can't be an ancester of Rupert. Did the researchers validly ignore this ? Apparently the East India Company, which ran the colonial parts of India before 1858, encouraged their staff in the 17th and 18th centuries to marry Indian women to alleviate homesickness and keep the staff in India, by giving them a bonus of a pagoda coin for each birth, but by the time Louisa was born, the practice had stopped; there were also restrictions on financial assistance and employment opportunities for Indo-Britons. These pagodas were small gold coins issued in Madras and other places, worth about 3½ rupees or about 7 shillings (35p). That might not seem much today, but in the Borders in the 1840s, 7 shillings would have been half a week’s wages for a wright, or a week’s wages for a weaver; and in India it would have had much greater purchasing power. Families In British India Society and Indiaman Magazine look like useful resources, if you can put up with the pop-ups and instant audio of the Indiaman Magazine. After our successes in transcribing the stones at Stobo and Jedburgh Abbey earlier in the summer, last weekend we turned our attention to Coldingham Priory. In many ways this proved to be the most challenging of all. While the stones have weathered reasonably well this is a very large graveyard with approximately 1000 stones (we have still not yet done a final count) and with a very large number of older stones – Cargill, in 1969, recorded 279 pre-1855 stones. The week-end did not get off to too auspicious a start as the weather on Saturday was cold and overcast but what a difference on Sunday when the clouds had cleared, the wind had dropped and the sun shone - such a day when recording can be such a delightful pastime. While support from our own members could have been better we were delighted to have along to assist on both days a number of members from the Friends of Coldingham Priory who joined in with considerable enthusiasm. In all we recorded and checked approximately half of the stones although this included probably the majority of the older stones. The general feeling, having gained a momentum, was that we should press on and we have arranged a further transcribing day on Saturday 28th August from 10 am to 4 pm. Anyone who would wish to join us do please come along (even for a couple of hours). Further details from Ronald Morrison via our Contacts page, using the contact type Gravestone Recording. Coldingham Priory has a rich and colourful history being one of the many hidden gems of the Borders. It has s been a site of worship since 1100 when Edgar, King of Scots was present at the dedication of a stone church to St Mary, St Cuthbert and St Ebba. The latter had founded a religious community in the 7th century at St Abbs Head nearby. From 1098 successive charters were granted to the Benedictine monks of Durham who established the priory in the early 12th century. The priory estates “Coldinghamshire” stretched from the boundaries of East Lothian to Berwick on Tweed and into the Merse at Swinton and provided strong revenues. A replica of the first charter is on display in the church porch. The first church was destroyed by the English King John in 1216 and rebuilt as a much larger cross-shaped church. The north and east walls of the choir are still forming part of the present day church. Monastic remains of the cloisters and south transept can be seen outside. The priory was frequently attacked, and plundered for its wealth until in 1650, Cromwell succeeded in blowing up the major part of the church which Scottish troops supporting the King were using to store gunpowder and as a stronghold. In 1662 two walls of the choir were rebuilt to form the structure in use today. Further alterations took place in the mid 19th century to repair some of the damage and neglect of the past which enables the fine carved stonework of the interior to be seen. The Friends of Coldingham Priory which is a registered charity was formed in 2000 following the celebration of its 900th founding charter in 1998. Today this grade 1 listed building is a living church belonging to the Church of Scotland. Friends can belong to any denomination or none. 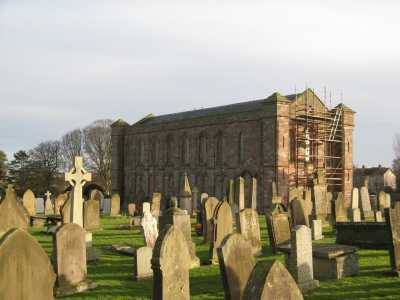 Their main aim is to promote public awareness of the Priory as a site of historical and architectural importance which is closely linked to the early Christian sites at St Abbs Head, Lindisfarne and Durham. They do this by welcoming visitors at open afternoons in the summer and at occasional concerts and exhibitions. Friends can act as volunteer stewards at these times and also help to raise money to support the local congregation in improving the physical appearance of the Priory. Since 2006, the Friends have been partners with Scottish Borders Council, Tweed Forum and Archaeology Scotland in a project to conserve, stabilise and interpret the monastic ruins. They have undertaken the creation of a wild flower garden with fruit trees and shrubs in a walled area south of the refectory. This project will culminate in October 2010 with the creation of a flag stoned entrance to the graveyard and new paths to enable all abilities to enter the ruins and the garden. Headland Archaeology has carried out surveys and supervised all archaeologically sensitive sites during these works. In May 2009 the Friends gave a film presentation at Queen Margaret’s University as part of the first Scottish conference for community archaeology. In September 2009 the Friends organised a local history weekend at which our Society was present to give local people an opportunity to enjoy and share material on display and an attendance of well over 300 showed much interest. The Friends number about 35 but only a dozen or so are active and are struggling a bit at present to keep going and would welcome new members with new talents and experience. There is an annual subscription of £5.00. For further information contact the Friends of Coldingham Priory Secretary, Julia Carter. More details about the Parish of Coldingham. This blog by Ronald Morrison. Business Archives in Scotland has now finished its National Strategy document covering the next 5 years, following the consultation which finished in June. It's a 22 page PDF (654 Kb). Our response to the draft strategy was in a blog on 27th May. Personally, I can't see much difference from the draft strategy, except that there is a new intention to publish a guide to managing business archives in Scotland which will include case studies and examples of business making use of their archives and the return on investment they can bring. That seems a really good idea and I look forward to seeing and using the guide. Following on from our successful weekend in June recording the monumental inscriptions in and around Jedburgh Abbey, we’ve got another training weekend on the 14th and 15th August and this will be at Coldingham Priory, Coldingham. Berwickshire jointly with the Friends of Coldingham Priory. This will run from 10am to 4 pm on Saturday, and on Sunday from 1pm to 4 pm. The Priory isn’t often open, so this is a chance to see inside, as well as testing your skills deciphering the inscriptions on the gravestones. If you would like to take part at Coldingham Priory on one or both days, even for a few hours on either day, please contact our organiser, Ronald Morrison via our Contacts page, using the contact type Gravestone Recording. This will enable us to coordinate the work, confirm to you more precisely what is involved and advise in the event of any change in the arrangements. For almost 5 days our Home Page and our Blog were offline, due to mistakes by our web host. It's annoying that they happened at all since I hadn't made changes that could have caused that. What's much more upsetting that the web host took 5 days to reinstate the site as it was. I spent hours chatting to their technical support, but for the first 4 days all I got was empty promises. Thanks to all of you who emailed me to say you couldn't get in, and thanks to all of you for putting up with our absence. For the record, if you had bookmarked a page other than the Home page or blog you could have got in and used the site normally. The long URL for the Home page http://www.bordersfhs.org.uk/Index.asp worked fine all the time. 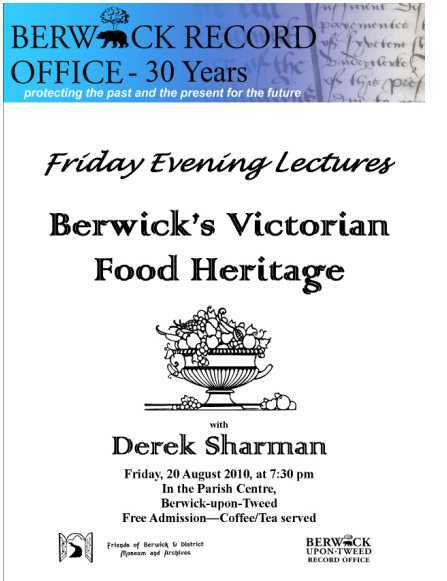 The next event to celebrate 30 years of Berwick-upon-Tweed Record Office will be held on Friday 20 August 2010 at 7.30pm in the Parish Centre, Berwick-upon-Tweed, Berwick-upon-Tweed, TD15 1DF, England. Map. It's next to Holy Trinity Church. Entrance is through the churchyard. The suggested car parking is near the Barracks and Wallace Green. 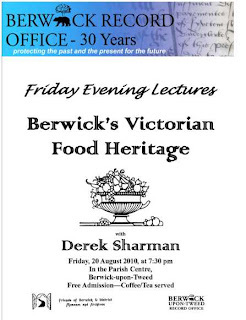 Derek Sharman will talk on Berwick’s Victorian Food Heritage. Everyone is welcome, whether you are a local resident or holidaymaker, and admission is free and refreshments will be available.